The black bear ranges across forested Canada from Newfoundland to British Columbia as well as much of the United States. A solitary animal most of the year, they pair up briefly during the mating season. Cubs remain with their mother for about a year, who protects which prevents them from being killed by the adult males. They have few enemies, but the one they fear the most is the Grizzly. Whenever their territories overlap, the latter is given a wide berth. Black bears can be found from northern Alaska east across Canada to Labrador and Newfoundland, and south through much of Alaska, virtually all of Canada, and most of the U.S. into central Mexico . Prime black bear habitat is characterized by relatively inaccessible terrain, thick understory vegetation, and abundant sources of food in the form of shrub or tree-borne soft or hard mast. The spruce-fir forest dominates much of the range of the black bear in the Rockies. Important nonforested areas are wet meadows, riparian areas, avalanche chutes, roadsites, burns, sidehill parks, and subalpine ridgetops. Black bears are usually black in color, particularly in eastern North America. They usually have a pale muzzle which contrasts with their darker fur and may sometimes have a white chest spot. Western populations are usually lighter in color, being more often brown, cinnamon, or blonde. Some populations in coastal British Columbia and Alaska are creamy white or bluish gray. Total body length in males ranges from 1400 to 2000 mm, and from 1200 to 1600 mm in females. Tail length ranges from 80 to 140 mm. Males weigh between 100 and 300 pounds, females weigh between 90 and 500 pounds. Black bears are distinguished from grizzly or brown bears by their longer, less heavily furred ears, smaller shoulder humps, and a convex, rather than concave, profile. Females reach sexual maturity at from 2 to 9 years old, and have cubs every other year after maturing. 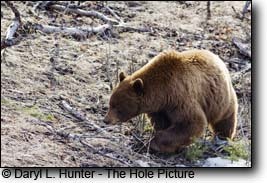 Males reach sexual maturity at 3 to 4 years old but continue to grow until they are 10 to 12 years old, at which point they are large enough to dominate younger bears without fighting. Male black bears do not contribute directly to their offspring but do indirectly by deterring immigration of new males, thus ensuring territorial spacing and reducing the amount of competition for food. Black bears can live to 30 years in the wild but most often live for only about 10, primarily because of encounters with humans. More than 90% of black bear deaths after the age of 18 months are the result of shootings, trapping, vehicle collisions, etc. 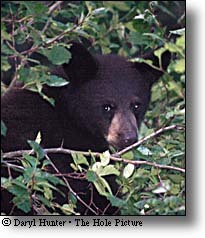 Black bear cubs remain in the den with their sleeping mother and nurse throughout the winter. When the family emerges in the spring the cubs weigh between 4 and 10 pounds. They are ususally weaned at around 6 to 8 months of age, but remain with the mother and den with her during their second winter of life, until they are about 17 months old. At this time the mother forces the young out of her territory. They may weigh between 15 to 100 pounds at this point, depending on food supplies. Black bear mothers care for their young and teach them necessary life skills throughout the time that their cubs are with them. Male black bears do not contribute directly to their offspring but do indirectly by preventing new males from moving into the area. This makes it less likely for the young or mother to encounter an aggressive male or have to compete with new bears for food. Throughout their ranges in North America, black bears consume primarily grasses and forbs in spring, soft mast in the form of shrub and tree-borne fruits in summer, and a mixture of hard and soft mast in fall. However, the availability of different food types varies regionally. Only a small portion of the diet of bears consists of animal matter, and then primarily in the form of insects and beetles. Most vertebrates are consumed in the form of carrion. 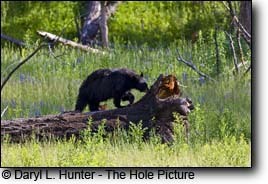 Black bears are not active predators and feed on vertebrates only if the opportunity exists. 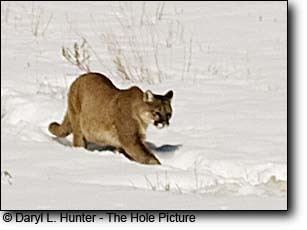 * mountain lionsBlack bear cubs may be at risk of being killed by large predators, such as wolves and mountain lions. 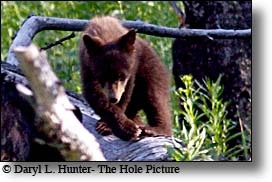 However, most black bears that are killed, young and adults, are killed by humans. Some bears have become troublesome around camps and cabins if food is left in their reach. Black bears have severely injured and sometimes even killed campers or travelers who feed them. 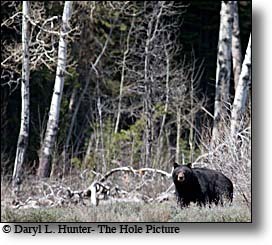 However, the danger associated with black bears is sometimes overstated, fewer than 36 human deaths resulted from black bear encounters in the 20th century. Black bears are generally very timid and, unlike grizzly bear females, black bear mothers with cubs are unlikely to attack people. 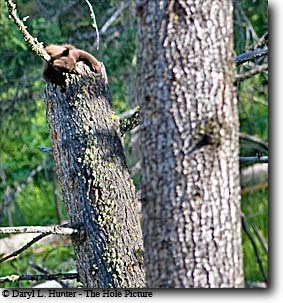 When black bear mothers confront humans, they typically send their cubs up a tree and retreat or bluff. 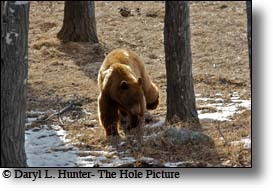 People who live in or visit areas with black bears should be aware of the appropriate precautions for avoiding black bear encounters. 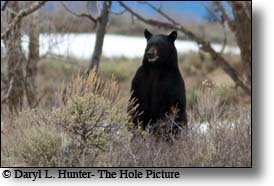 People have intensively hunted Black Bears for trophy value and for various products, including hides for clothes or rugs, and meat and fat for food. 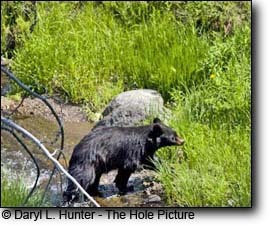 In most of the states occupied by black bears, they are treated as game animals, subject to regulated hunting. An estimated 30,000 individuals are killed annually in North America. Relatively few skins go to market now, as regulations sometimes forbid commerce and there is no great demand.